The Best Peanut Butter Cookies Ever! This past weekend I made peanut butter cookies. In part because I had a jar of peanut butter that needed to be finished off ASAP. It was “natural” peanut butter that had separated during our move to Colorado and didn’t look so hot. I figured mixed into the cookie dough well enough it’d be fine. The recipe I have for peanut butter cookies is adapted from a basic recipe I saw on the All Recipes website. It’s very basic. However, I added in some techniques that makes them almost melt-in-your-mouth! I was very pleased that this recipe worked at my home’s higher altitude also. It’s science, my friends! See below in the instructions. Mix together the flour, baking powder, salt, and baking soda. Set aside. Using the whisk attachment on a stand mixer, cream the butter, peanut butter, and both sugars. DO NOT SKIMP on this step. You want to beat this for 5-7 minutes until the mixture is light and fluffy. Walk away for a few minutes, catch up on your mail…fold the laundry. Stop the mixer every once in a while to scrape down the sides of the bowl. You are incorporating air bubbles into the mixture which helps give the cookie dough a lighter texture when baking. With the mixer still running, add the eggs, one at a time. Beat mixture until it lightens in color, another 1-2 minutes. Stop using the mixer now! You will now want a large spoon or spatula to slowly mix the dry ingredients into the butter/sugar/egg mixture. Stir until all the dry ingredients are incorporated. Cover with plastic wrap and chill the dough in the refrigerator for at least 1 hour. Roll the dough into 1 – 1 1/2″ balls and place at least 2″ apart on an ungreased cookie sheet. Using a fork dusted in flour, make the ubiquitous waffle-like fork-tines pattern on the ball of cookie dough, flattening it just a little. Bake in a 375F oven for 10 minutes. Do not overcook. As much as I love the texture of this cookie, I’m still trying to tweak the recipe to bring out more peanut butter flavor. This past weekend’s recipe had dark brown sugar and I think it subdued the peanutty flavor some. Also, this peanut butter was sort of old, dating from this past spring. I would like to try this recipe with light brown sugar and fresh-made peanut butter. I might be doing that as soon as this weekend, Dave requested peanut butter chocolate chip cookies and I have a bag of Wilbur chocolate chips for him! 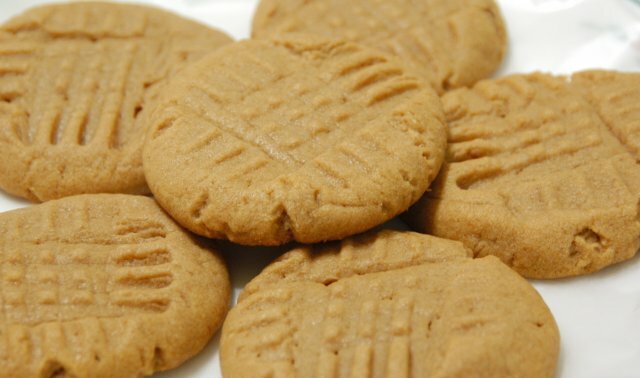 What’s your favorite peanut butter cookie recipe! Share it with us!